Appellation or Vine Lugana D.O.C. 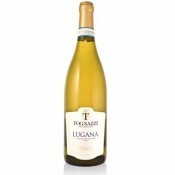 This Lugana Selezione Oro comes from vines that had a short pruning to reduce the number of bunches and increase the quality of the must obtained. The harvest is delayed by 15-20 days compared to the basic Lugana: this slight over ripening allows for a more fragrant and structured wine. The wine matures for a long time in the vat on the fine lees and is bottled at the end of the summer. It differs from the basic type due to its structured and greater aromatic taste and smell. It has a good consistency with aromas of yellow pulp fruits and nuances of mulberry flowers in the finish. Tognazzi Benedetto’s farm is located in the east side of Brescia, in the DOC area for the production of the Botticino red wine. This zone is famous worldwide for its marble, used even for the construction of the White House and the Tomb of the Unknown Soldier in Rome. 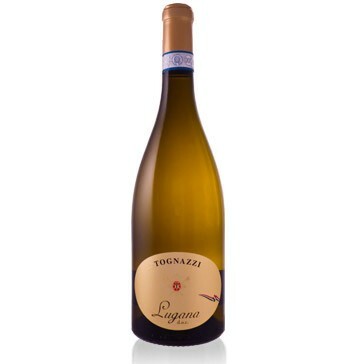 The Tognazzi family has been a grape grower for three generations, they cultivate their vineyards under the shiny slopes of the Prealps on carbonate-array soil. The mild climate of this area has been always favourable to the cultivation of vineyards since remote ages. The farm is conducted directly from the owner, which is an expert grape grower and has chosen, during the years, the most suitable lands. He follows personally all the production stages, always believing that the good wine comes from the vineyard. In 1998 the farm has acquired new vineyards in Peschiera del Garda, suitable for the production of the Lugana DOC white wine. Excellent with white meat, fish, vegetables and delicate cheeses. Serve at 4-6° C in a medium-sized trasparent crystal glass. This wine has a long life and can be drunk even after several years. Bottles should be laid horizontally in a cool, dark, humid wine cellar.